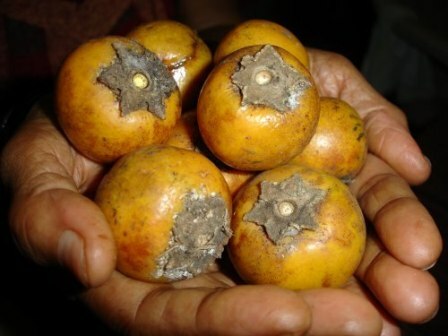 Tendu is a fruit from India. It grows in very large numbers in the forests of Central India. 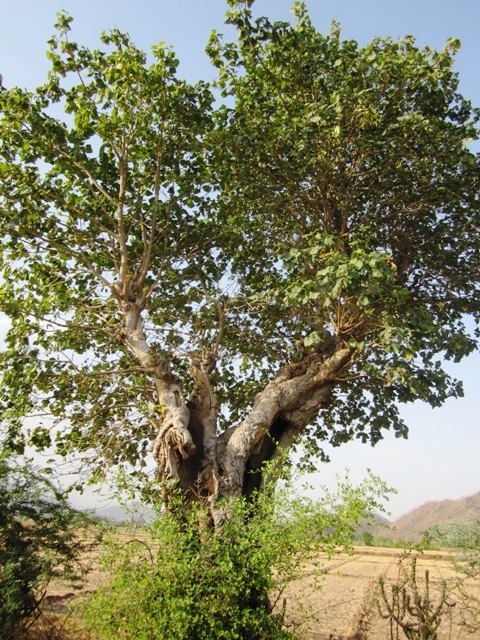 Though its fruits are edible, but the tree is economically important for its leaves which are used for making an improvised type of cigarette which is smoked by poor and labour class people in India. 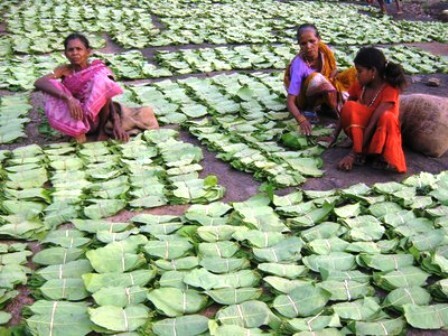 Every year right to harvest tendu leaves from trees growing in the forests is sold by auction by State Governments top tribal people living in the forests. They harvest the leaves and use it further for making bidid which is a big industry in India. A medium-sized tree, upto 25 m, and 1.9 m girth; bark pelican, exfoliating in rectangular scales. Leaves opposite or alternate and coriaceus, up to 35 cm long, tomentose on both sides when young, becoming laborious above when fully grown. Male flowers are mauve in colour, tetramerous 1-.5 cm long, sesile or nearly sesile and short peduncles, mostly 3-flowered. Fruits olive green, ovoid or globes 3-4 cm across; pulp yello, soft and sweet. Seeds 1 to 8 seed per berry. The tree is deciduous or evergreen depending on its habitat. In a moist locality, its evergreen. The flowers appear from April to June on new shoots and the fruit ripens after 1 year. The edible fruits are largely eaten and are emanated by fruit bats and birds, notably hornbills. The tree produces god seed in alternate years. Tendu tree demands light; is drought and frost hardy but sensitive to water logging. 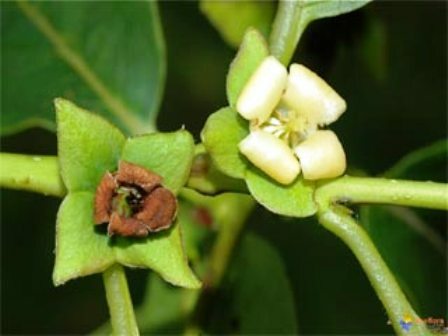 It is normally found in a dry deciduous forest as constituent species of Tectona grandis, and mixed forest of Acai leucophlea, Boswelia serat, Butea monsperma, Lanea cormandelica and Terminali tomentosa. Altitude: 100 – 700 m, Mean annual temperature: 0-48 ⁰C, Mean annual rainfall: 500-1250 mm. Soil type: Tendu is the most widely distributed and tolerant species when considered to soil requirements. It grows on poor denuded soils, hot and dry hill slopes, stony soils with quartz, shale and sandstone, and also heavy clays. It however attains best growth and development on loose, porous soils and moist valleys where it tends to be gregarious. Fruit: Fruits are edibleFruits have a cooling and astringent effect. Food: The fruits and powdered seeds are sold in local markets and eaten. Fodder: A tolerance to pruning makes D.melanoxylon a good fodder species. The leaves are ported to contain 7.12% crude protein and 25.28% crude fibre. Fuel: D.melanoxylon is reported to be god fuel wood; calorific value of sapwood is 4957 kcal/kg and of heartwood, 503 kcal/kg. Timber: Wood is hard, whitish-pink, tough, fairly durable and used for building, shoulder poles, mine props and shafts of carriages. The bony is very heavy and valued for carving and other monumental works. 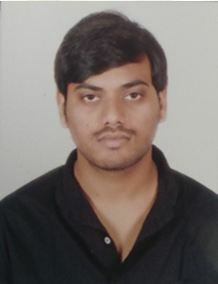 Medicine: The seeds can be in toxicating; they have been prescribed in India as a cure for mental disorders, nervous breakdowns and palpitations of the heart. Propagation : No vegetative propagation method is standardized in Tendu, commercially it is propagated through seeds. Orthodox seed storage behavior; viability maintained for 1 year in open storage; viability lost within 1 year in hermetic storage temperature with 1-15% moisture. About 5 kg of ripe fruit yields 1 kg of seeds. Spacing: For fruit production the seedlings are planted at a distance of 8 meters. The seedlings are normally planted at 2 m by 2 m where the objective of management is the production of leaves. Training and pruning: 3-4 scaffold branches is selected at topped plant at height of 0.75 to 1 m from ground. Pruning is not essential for fruit production however lightly pruned to maintain canopy. 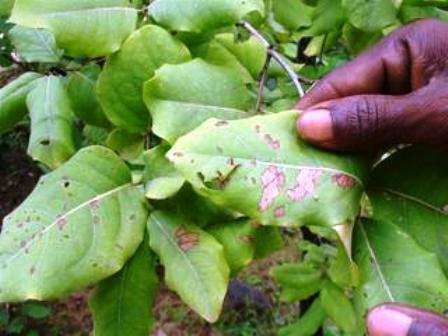 Heavy pruning is recommended for leave production as this promotes vegetative growth and the production and thin leaves, although repeated pruning can cause stunted growth of trees. Plants up to 15 cm in girth are cut near the ground to encourage sprouting of copice shoots, which gives best quality leaves after 40-50 days of operation. Copicing experiments in India show the best quality of trade leaves are obtained by copicing flush to the ground level twice, 2 weeks apart, then copicing flush to the ground only once. Inter cropping: The results of regular cultivation of tendu mixed with agricultural crops are not known. Its cultivation field boundaries or distributed in field crops, such as oil-seed and cereals crops, appears to be a feasible and attractive proposition. Its deep tap-rooting habit would minimize competition with annual crops. Yield: A fully mature tree of tendu gives 80-200 fruits per year. Trioza obsoleta feeds on the sap and forms rough reddish-yellow galls on the leaves. Among the defoliators are Euthali audabils, E.nais, Lamida crbonifera and Miresa lbipuncta. The larvae of Plocaedrus ferugineus bore between the bark and the sapwood. Two sprays of Chlorpyrifos 20 EC @ 0.2 % during onset of monsoon and early winters may control these pests. The fungus Sterum lobatum cause white spongy rot infeld timber while Cercospora kiki cause leaf spot. Bidi is a kind of cigarette smoked in the Indian sub-continent. But there is no paper. 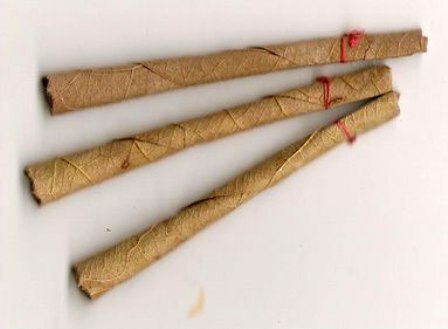 Tobacco is placed inside a dried tendu leaf and is then rolled. It contains much less tobacco in comparison to cigarette. It is a poor man’s cigarette. Some people rate bidi less injurious to health than the cigarette because of absence of paper. Collection of leaves: Leaves are plucked just after they have turned from crimson to bright green and have a leathery texture. Generally, collection starts from the second fortnight of April and continues until the onset of the monsoon. Bundles of 50, 70, or 100 leaves (depending on drying conditions) are assembled and tied with strings or fibers from bark. Drying and curing of leaves: Proper drying of leaves is important. Too much moisture makes the leaves black and mouldy with foul odor. Too much drying makes the leaves brittle, resulting in loss during handling. To dry, leaf bundles are spread or the ground, keeping the dorsal sides up for three to four days. The bundles are then turned upside down. Drying is complete in about 8 to 10 days. In solar leaf driers, the drying is complete in about 18 hours and the greenish color of the leaves is retained These leaves fetch a higher price and damage from termites is avoided. Solar drying, however, can only be done where electricity is available for the air blower. Packing and storage: Dried leaves are packed in gunny sacks for storage in godowns until sold or used for making bidis The number of leaves in one standard bag varies from state to state. Before filling the bags, water is sprinkled on bundles to softer the leaves for easier packing. Annual production and value: Around 300,000 tons of bidi leaves are produced annually in India, of which over 85 percent is collected from the states of Chhattisgarh, Madhya Pradesh, Orissa, Maharashtra and Andhra Pradesh. The value of these leaves is based on an average price of Rs 15,000 per ton, but rates vary from state to state, according to demand, availability of leaves, and location of bidi-making industries.